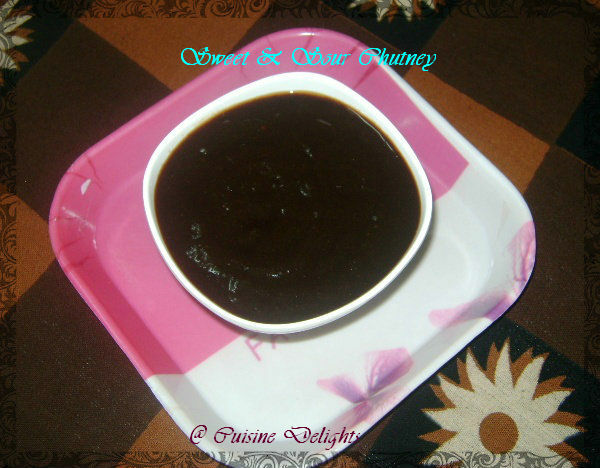 My first microwave recipe, Sweet & Sour Chutney is tasty accomplishment for many dishes. This chutney taste is incredible as a spread for sandwich or as a dip for snacks. It has a sweet and sour taste, hence it is perfect to sprinkle on top of samosa, bhelpuri, chaat and many more. Soak the tamarind and dates (if not using syrup) for half an hour and extract the juice. Add it to a microwave safe bowl and micro high for 4 minutes. Add the rest of the ingredients and micro high again for 3 minutes. If it is still very watery, micro high for another 2 minutes. Cool and store in refrigerator and use it for chats. It tastes great with idly dosas too.